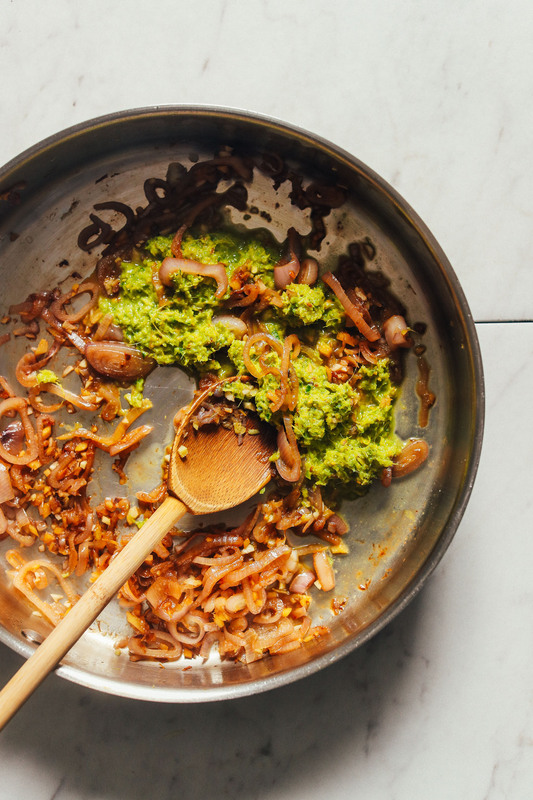 I love this dish because it’s both Indian- and Thai-inspired, using both split mung beans (or moong dal), and my go-to Thai-inspired green curry paste. Let me show you how it’s done! This 1-pot meal starts with soaked moong dal (a.k.a. split mung beans). While that’s happening, you can prep your fresh green curry paste (or opt for store-bought!) and veggies. First we start with sautéed shallot, ginger, and garlic before adding the green curry paste, which adds the primary flavor to this dish. Next comes chopped cauliflower, coconut milk, coconut aminos for depth of flavor, maple syrup for sweetness, and a little lime for acidity. The soaked moong dal is added and once tender, we throw in a generous amount of greens (I went for kale) and cover to wilt. Then, it’s serving time! It’s that easy. This would make the perfect hearty meal when you want something nourishing and delicious. It’s tasty as is, or (our preference) served over grains (like rice or quinoa) and garnished with fresh lime and cilantro. 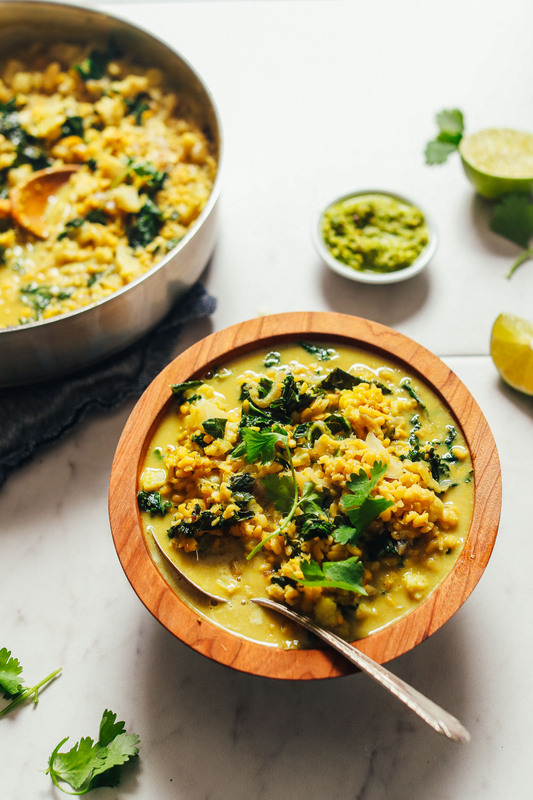 If you’re into curries, also be sure to check out our 1-Pot Golden Curry Lentil Soup, 1-Pot Chickpea Cauliflower Yellow Curry, Rich Red Curry with Roasted Vegetables, and 1-Pot Pumpkin Yellow Curry! 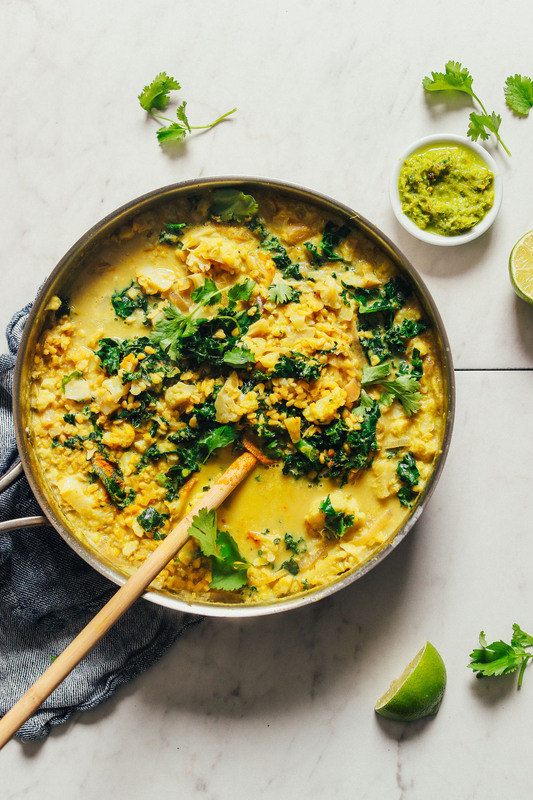 Green curry with coconut milk, moong dal, cauliflower, and loads of greens! A hearty, flavorful, 1-pot meal! Add moong dal to a bowl (or pot) and cover with water. Allow to soak for at least 1 hour (to increase absorption and speed cook time), or overnight. Then rinse, drain, and set aside. Heat a large rimmed skillet or pot over medium heat. Once hot, add oil, shallot, ginger, and garlic. Sauté for 2-3 minutes, stirring frequently. Then add curry paste and cook for 1-2 minutes more. Add cauliflower and sauté a few more minutes. Add coconut milk and stir to combine. Bring to a simmer. Then add soaked drained moong dal, coconut aminos, and maple syrup and stir. Return to a simmer and cook for approximately 15-20 minutes or until moong dal is tender. In the last 5 minutes of cooking, add kale and stir until wilted (about 3 minutes). 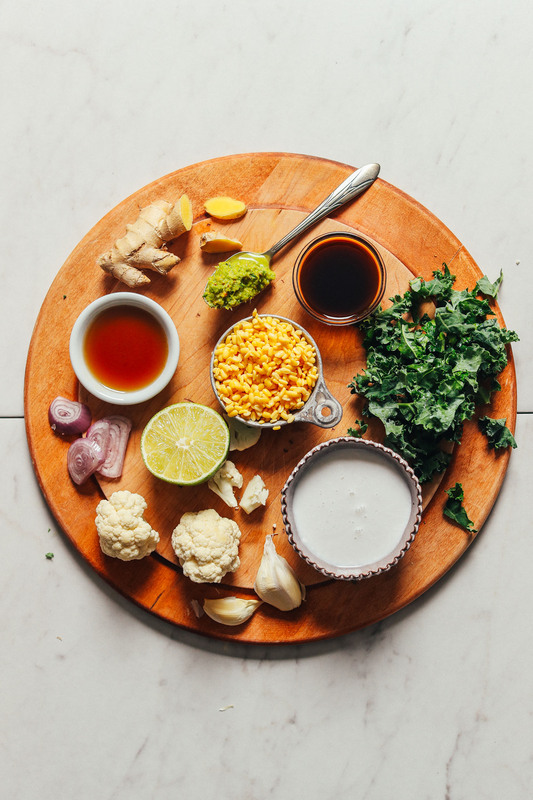 Taste and adjust flavor as needed, adding lime juice for acidity, maple syrup for sweetness, coconut aminos or salt for saltiness, or green curry paste for more intense curry flavor. Serve plain like a stew, or over grains like rice or quinoa. Garnish with cashews and lime juice (both optional). Store leftovers in the refrigerator up to 4-5 days, or in the freezer up to 1 month. Reheat in the microwave or on the stovetop. Rehydrate with water or coconut milk as needed. *Prep time includes soaking dal. *If you can't find moong dal, you can sub golden lentils or brown or green lentils. Soaking is still recommended, but adjust cooking time as needed. *Nutrition information is a rough estimate calculated with avocado oil and lesser amount of kale, and without optional ingredients. I have made this recipe multiple times. I often use one can of coconut milk and the rest substituted with veg stock because for me it’s too creamy (my husband prefers all coconut milk!). I’ve used broccoli for half of the cauliflower too and it’s great. I always use about 3-4 tablespoons of store bought curry paste. Make sure you soak the moong beans prior as instructed (even just an hour). I didn’t do this once because I had no time and it wasn’t as good. My 2yo devours this! 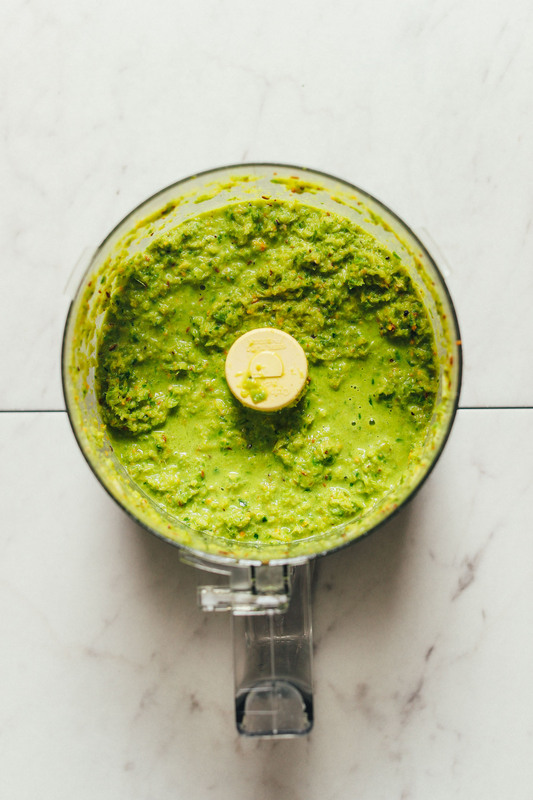 I used a store bought green curry paste, because I didn’t see your recipe for homemade – I can’t wait to make that. I added diced white skin-on potato along with the cauliflower and kale. I could only find split yellow lentils, which may be the same as the moong beans. was delicious over brown jasmine rice. It made about 7 servings. I’m definitely making it again! I didn’t care for the recipe using the 2 cans of coconut milk. I found it too sweet and coconutty. I’m going to try it again and use only 1 can plus the stock and eliminate the maple syrup. Also my cauliflower became mush. I may have needed to soak the beans longer. This recipe has much potential, I just need to tweak it for my tastes. This recipe was soooo delicious! I meal prepped the green curry paste recipe & moong beans over the weekend and made this in 20 minutes! Made this a few days ago. I used half coconut milk half broth which was creamy enough for me, also used red curry paste (and less) as that is what I had on hand, def wanna try your curry paste next time though! I don’t normally cook with mung beans so I enjoyed the variety. I think next time I’d do less cauliflower and add other veggies, it’s a bit too cauliflower-y but all in all good recipe and super filling – half a serving with a piece of naan is enough for me. Thx for the recipe! Another excellent, easy to follow recipe from MB! I used whole mung beans that were soaked overnight and they didn’t need any extra cooking time. I will definitely be making this again. I love this. 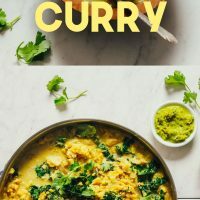 I’m not a big fan of curries normally but I recently became a mostly vegan eater and was looking for filling dishes and this is delicious. It’s a really comforting dish on a winter’s evening. My husband loves it also. Would really recommend. We’re so glad to hear that, Dani! Our large grocery (chain) store didn’t have mung beans (split or otherwise) and I won’t have a chance to get to a store that does before I make the dish. What do you think about using French lentils, which I have on hand? I also plan to add sweet potatoes (petite diced) to the dish. What do you think? I made this for my family tonight, and it was soooo good. Delish. I used one can full fat coconut milk and the rest low-sodium vegetable broth. I had a pack of sprouted mung beans, and though I did soak them for a couple of hours I’m not sure I even needed to. I used Thai and True (excellent brand!) green curry paste because I had it in the fridge and it was easy. Used spinach and served over brown rice. I can’t wait to have leftovers for lunch! 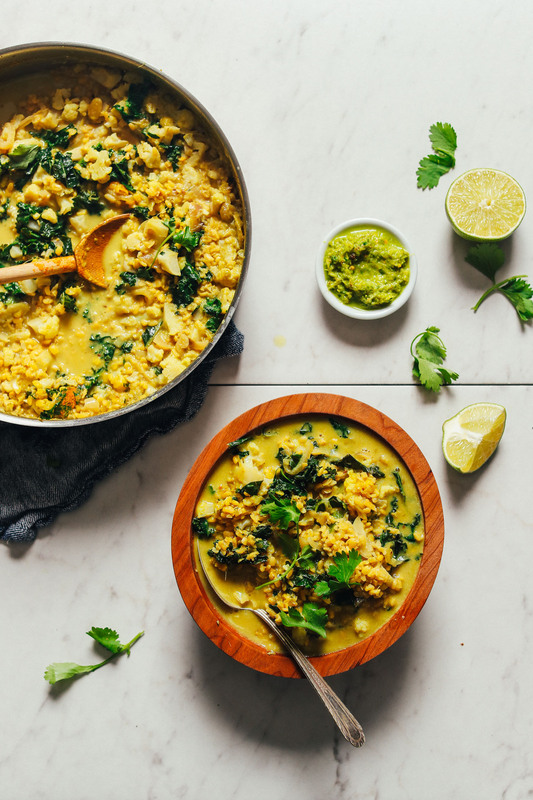 The green curry recipe is a must with this dish! It’s a keeper! Substituted lentils for moong dal beans. This meal is now permanently in my repertoire. Thank you! I made this with whole mung beans, as I did not have split ones. It was not a good choice. The texture was way off. If I had to do it again, I would use yellow split peas instead. Different flavor but better texture. Or wait until I can go to an Indian grocery. I made this and it was surprisingly tasty (I am an incompetent cook). It also made way more than I expected and it lasted for days! This was my first experience with a Minimalist Baker recipe and it was truly fantastic! I love cooking vegan food (I hate handling animal product) but I do struggle a little to get my husband on board. I packed this for his lunch today and he messaged me to say this was “extremely good” and I couldn’t be happier! I had trouble finding coconut aminos or tamari so that just didn’t get added. Also, I used green lentils because I could easily find those in the grocery store and I thought, YAY MORE GREEN! I will definitely make this again (I think I’ll make the curry paste ahead of time) and I look forward to trying the red curry you have as well. Really can’t wait! I think this is a wonderful website! And I love baking too so I’m excited to try those recipes as well. Keep up the awesome work! Love it! This was fantastic! Thanks for posting! This is delicious! I am thrilled with how the green curry recipe turned out! I used a small onion instead of scallions and I used one can of light coconut milk and the second one replaced with broth. I used mung bean that were not split that I soaked overnight (actually overnight and while I was at work all day) and the beans were tender after simmering 20 minutes. This is now one of my favourite recipes. Thank you so much for sharing! This was the third recepie I made from your blog and it was as wonerful as the other two! Full of different tastes, that come together in a perfect harmony, easy to make and also easy to substitute. With each of the receipes I didn’t have at least one third of the ingredients at home and substituted them with something from the same family of tastes. Each time it came out fantastic! My husdband “doesn’t believe in vegan” and he too loved every dish! Many thanks for your wonderful dishes! I forgot to pick up mung beans, so I used lentils that I had instead, and it was still SLAMMIN’. Is that why mine wasn’t this yellowish green color? Likely, yes! We’re glad you enjoyed it with lentils! Hi, i should have read the comments before cooking this dish because i’m using whole mung beans because there were no split mung beans at my store. I soaked them an hour and 15 minutes prior to cooking them. They are super small and on the package it says no soaking needed but cook for 45-60 minutes. I thought an hour of soaking and the cooking time would be fine…now i’m not so sure. What kind of salad would you serve with this? It looks filling but I think I might want to round out the meal a little. I would serve this dish with this delicious Simple Green Salad with Lemon Vinaigrette! This was AMAZING!!!! I’m a new fan of your website and have LOVED everything I’ve made so far. This recipe and the Budda Bowl Chickpea Sweet Potato recipe are divine! Thank you! I made this for dinner tonight. It was simple, fast, and so delicious. I followed the recipe to the t. I will be making this over and over again. Thanks for sharing this wonderful recipe! I didn’t have moong, so substituted urad wash, a/k/a “white lentils” which are closely related. Worked just fine. Used a combo of cauli, broccoli, and carrots for the veg, red kale for the leafy greens, and subbed broth for about 1/3 of the coconut milk, to make it a bit lighter. This seems like a recipe that you can make work with a lot of different vegetable combinations. oh my goodness this was so good! super easy to make, filling and SO FULL OF FLAVOR! definitely saving this recipe for quick weekday meals. I made this recipe this week and it was FANTASTIC! I am a die-hard Minimalist Baker cook and this recipe is right up there on our “favorites” list. In fact, I often take some of what I’ve made to my Mom so she doesn’t have to cook. She deemed this dish her favorite thus far. Had it for leftovers as well and it was super! Not soggy and all the flavors had melded together! Thanks for another yummy meal! I made this last night and it was delicious! Can’t wait to have it again. * Used lentils versus mung beans and doubled the amount. * Definitely doubled the spinach from recipe suggestion and probably did as well with the cauliflower (I didn’t measure, just used two bags of the pre-cut stuff from the grocery store). All this made it way thicker, which I appreciated so I didn’t *have* to serve it over rice. I used soy sauce in place of the coconut aminos (since it said I could use tamari) and I would say it turned out a bit salty — but that’s not the original recipe’s fault, it’s mine. And I don’t typically use a lot of salt either so could also just be my sensitive tastebuds. Will DEFINITELY be making again! Ah, thanks Sayde! So glad you liked it. We’re glad you enjoyed it, Bibi! OMG! that is first and the best curry I’ve ever made. I made the green curry paste as well. It tastes sooo goooddd!! I omit few things because I couldn’t find it. Im not a cooking person but i have to cook for healthier me or maybe go vegan because of certain condition. Thank you Dana! I love it! I will try more recipes! I made the delish green curry sauce to go with the cauliflower dahl tonight. However, I need advice. I can only find whole polished moong beans, or also masoor and moong split mix that is more the red lentils than the moong split beans. Will either of these work? I don’t have the green or brown lentils either, only red, and did buy both the above mentioned beans. Please help! I REALLY want to make this dish asap. Thanks!! This looks amazing!! I just bought your photography school bundle course, already watched a few videos, I’m so excited!! Hoping you do a videography course sometime or even a photography retreat/day, I’d totally sign up! This is outstanding- the dal keeps it from being too watery (which I find most green curries are) and the flavour is so good. I used a combo of brocolli and cauliflower and Swiss chard instead of kale. Will be interested in seeing how it holds up in the freezer. – I used whole, sprouted dry mung beans because that’s all I had, so those needed to cook a bit longer (according to their package). – To have less waste, I incorporated the kale stems – diced them and added those in to cook when the cauliflower went in. – To save some time, I used only store-bought green curry paste, so 2 Tbsp was sufficient. – I added 1 tsp each of turmeric and cardamom. Thanks so much for sharing your process, Eva! This looks outstanding. And the kale ginger combo I am loving. Can’t wait to try this!! This was yum! A great synergy of flavour and tastes. We liked the texture of the moong dal in the curry. Because I had a lot, I put chopped basil on at the end rather than cilantro. That worked. I thought i ordered the right dal on Amazon for this but looks like I got Chana Dal – split chickpeas? Will that be ok to use? We haven’t tried with those and can’t say for sure, but let us know how it turns out! Dana, this was phenomenal. Starting withthe green curry paste it was a total winner. Five adults loved it and requested it again in the same week!!. Pure genius Dana. Thank you. This was excellent, both my husband and I loved it!! I used one can of light coconut milk and an equal amount of unsweetened almond milk, and the result was perfect for us in richness and consistency. We did not have mung beans, so I subbed chick peas that I cooked (from dried) in advance. The toppings (in our case fresh lime, toasted cashews, and sliced jalapeños) added even more flavor. I am sure homemade curry paste would have been even better, but for a shortcut I love the Thai and True products from Oregon – vegan, and real ingredients – http://www.thaiandtrue.com/Green-Curry-Paste_p_9.html. Thanks for a great, and easy recipe! Lovely! Thanks for sharing, Linda! Hi! This was delicious! I followed the directions exactly (with spinach). The chopped cashews, cilantro and squeeze of fresh lime before serving made it even better. Thnak you for the great recipe! FYI – I usually by a glass jar of Thai green curry from grocery store … and I end up throwing out most of it because it doesn’t keep. This time, I bought a small can at an Asian grocery which was exactly 5T. It was spicy and perfect for this recipe. And about 1/3 the price with no waste. Lovely! Thanks for sharing, Gina!! Like with EVERY recipe you share, the first try always turns out soooo good. Followed exact directions and turned out delicious. Did store bought green curry to save on time. Had a small bowl with a 1/2 cup of cashews. Delicious!! And will probably do leftovers with some rice. Could see experimenting with potatoes or other veggies to mix it up. Or thinking to pair with those potatoes pancakes on your site. This can be one in regular rotation for sure. Thank you this gem!! Excellent recipe! I live in a small town and could not find split mung beans so I just subbed a can of lentils at the end of cooking (just before the kale). I used a jar of green curry paste and cut back to 3 tablespoons which was perfect! Very tasty and will make this again, thanks! How would you adjust this to make it in an instant pot? Thanks! Hi Caro! We’re not sure, but assume it would work similarly to other soups. If you give it a try let us know how it goes! This was really good. I used green lentils since I couldn’t find split mung beans. My husband asked me what he should call it in the future so he knows what to request when we’re planning our meals in advance. Thank you! Lovely, thanks for sharing, Bailey!! Easy and delicious, spot on as always! Well, to be honest, the recipe was not too minimalist. I started when I got home from work and really, it took me over an hour. I also used yellow split peas instead of mung beans as I also had only whole ones. It’s a beautiful dish and my even my 16 year old is enjoying it. Thank you. Made this evening. This was delicious! Highly recommend. Hi Kate! I’m thinking mung beans would be great. But also green lentils would also work! Just adjust cooking time as needed. Wow – another winning recipe! I made this last night. It was SO good there weren’t any leftovers. I used the jarred green curry at the same ratio and it worked. I also used frozen cauliflower and put this over black rice. Next time I might add some heat, but this was truly delicious and easy to make. Thank you for another great recipe. This was absolutely delicious. I used normal red lentils as I couldn’t find the ones you specified at the time. But it only needed under 10 minutes until cauliflower was cooked and I had to add the spinach. Absolutely delicious definitely cooking again. yay! good to know! thanks for sharing, Karen! Oh my dear girl, this is absolutely the best stuff I have eaten in ages. I made it pretty much the way you described, except that I used a bit of onion instead of scallions (didn’t have any). The lime juice absolutely MAKES this dish exquisite. I have posted it to my recipe club (with full credit, of course) and I hope you keep up the good work. I am a long time subscriber. I am 69 and love learning new things! I can’t have coconut milk as it’s too high in fat. Realizing it has a specific flavor and consistency, can you recommend another plant milk in it’s place? Any plant milk would probably work, but might have to increase the sugar and salt or aminos. I bet it would still be good. Thank you. I’ll give it a go! North Indian dhals do not have any coconut milk and taste fine. I would leave it out or use a tiny bit just for taste. Carla, I’d think rice or cashew milk would be best here! This is DIVINE! I used Thai Kitchen Green Curry Paste instead of making my own. Thank you for the wonderful recipe! I wasn’t sure what I was going to have for lunch, and then I happened to check my email and also happened to have all of the ingredients for this recipe. And omg it is SO GOOD. yay yay! Thanks for sharing! If using full fat coconut milk, is one can ok, or should I still use two? Looks lovely, but I think I might roast my cauliflower before adding, a bit later in the process. I would do everything possible to avoid soggy cauli! 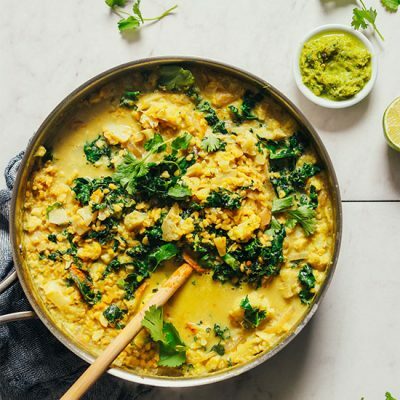 Your 1 pot Lentil Dal is so fantastic–this reminds me of it a little but I love the addition of kale and cauliflower. Can’t wait to try it! Thanks for sharing! I think roasted cauliflower would be awesome! I have whole mung beans, how would the cooking method change vs the split ones? I’ve never used and am anxious to try to this. I have whole ones too. I think I will sprout them first. Otherwise, I would soak them overnight for the recipe and probably allow a little extra cooking time to make sure they were soft. I don’t have coconut aminos either, so I’m wondering if 2 TB coconut flake would be a good sub? Coconut aminos is a substitute for soy sauce. It’s a little sweeter than soy sauce though. Coconut aminos can be subbed for tamari if gluten free, OR soy sauce if not gluten-free. For mung beans, I suppose you could sub whole instead of split. Just be sure to soak the night before and increase cooking time as needed!